IT’S BACKKKKK! 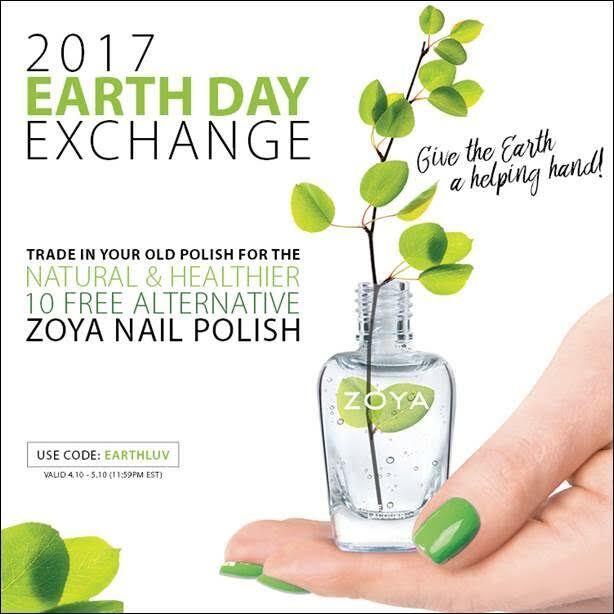 ZOYA EARTH DAY NAIL POLISH EXCHANGE 2017 – STARTS MONDAY. With over 300 shades rooted in a healthy philosophy, it’s no surprise that we’re committed to helping you green your beauty routine! That’s why each year we give you the opportunity to exchange any old nail polish bottles (any brand) that you may have laying around your house collecting dust, or that are not BIG10FREE formulas, for brand new toxin-free* Zoya Nail Polish shades to celebrate Earth Day. Rest assured that your unwanted polishes will be disposed of in an environmentally friendly manner. Make Mother Nature proud by following the instructions below and get started by picking out your NEW Zoya colors at www.zoya.com! Please note this promo excludes Zoya Treatments and Naked Manicure Base and Top Coats. 1. Visit www.zoya.com and add your desired nail polish colors to your cart. 3. Complete checkout and you're all set! Please see details below for instructions on sending back your unwanted polish.